A firm understanding of color and quality fundamentals are essential when it comes to color quality judgment and analysis skills. 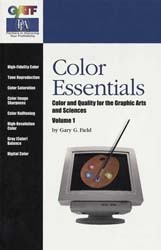 In order to eliminate some common misconceptions and to promote greater understanding, Gary G. Field explores the technical, practical, and perceptual facets of color quality through essays on topics such as color reproduction objectives, high-fidelity color, gray (color) balance, color saturation, high-resolution color, color image sharpness, and predicting color reproduction. Informal yet scientific in nature, these succinct essays stress principles as well as offer new insights into how the subjects apply to everyday graphic arts color reproduction issues. Reference listings of supplemental technical and scientific publications suggest avenues for further in-depth study.